Disney was known for zany comedies, but it seemed that all of their college-based films were guaranteed hits. The Absent-Minded Professor, Son of Flubber, The Misadventures of Merlin Jones, and The Monkey's Uncle made a ton of money for the studio. So it's hard to believe that almost five years passed before they would make another similar film. The reason may be that they were waiting for a star at the studio to reach the right age. With three Disney films under his belt, plus three TV movies for The Wonderful World of Color, Kurt Russell's star was on the rise and Disney was eager to test his marketability as a leading actor. A lesser-known talent at the studio, Joe McEveety, started as an assistant director in 1958 on Zorro and carried the same title on the Merlin Jones films. He began his writing career with this original story, written with Russell in mind to play Medfield College (of Absent-Minded Professor fame) student Dexter Riley. This production may have started with TV as the end goal, evidenced perhaps by TV director Robert Butler, who had never directed a feature film before. Joe Flynn from The Love Bug plays Dean Higgins. Other familiar faces include Richard Bakalyan (Never a Dull Moment), Cesar Romero (Zorro) and John Provost (Timmy on Lassie - non-Disney). Famous voice actor Frank Welker, most famous as the voice of Fred from Scooby-Doo, also stars in this and its sequels. Filming took place almost entirely on the Disney Studio lot. Interiors were built on the sound stages. The studio buildings, which Walt had designed to look like a college campus, doubled as Medfield College. The same backdrop used in Walt's tapings of the Disneyland series in out of his office window is used in Medfield's interior shots. Theses buildings represented college campuses before in the Merlin Jones series. Robert Brunner and Bruce Belland wrote the title song for the opening credits. A technical engineer who was working on building Walt Disney World in Orlando, FL named Ko Suzuki was brought in to create digital graphs and equipment used in the computer scenes. The film begins with an animated opening credits featuring computer bleeps and tennis shoes to the song "The Computer Wore Tennis Shoes." Dean Higgins of Medfield College can't afford to buy a computer for the school, to the detestation of Dexter Riley and his fellow students. Dexter is able to convince his old employer A. J. Arno to donate an old computer to the college, however Arnold is a crook who had his staff developing a computer to predict gambling outcomes. During a storm, Dexter sneaks into the computer lab to use the computer to help him cheat on a test and ends up getting an electric shock through the computer. During his test, Dexter discovers that he can dish out all of the answers at an extremely high rate, like a computer would. Dean Higgins has him checked out by a doctor who determines that he has become a human computer. Higgins forces him to compete on a game show to gain attention for the school. Dexter wins and becomes highly celebrated, catching the attention of A. J. Arno, who uses the old code in him to predict gambling bets. Dexter eventually gets kidnapped by one of Arnold's cronies and it's up to his friends to rescue him in the nick of time before a big game show that could win Medfeild $100,000. However during the rescue chase, Dexter bumped his head and in the middle of the competition, he begins to lose the computer's information and becomes normal Dexter Riley again. However, one of Dexter's friends on the team knows the final answer and wins the money for the school. 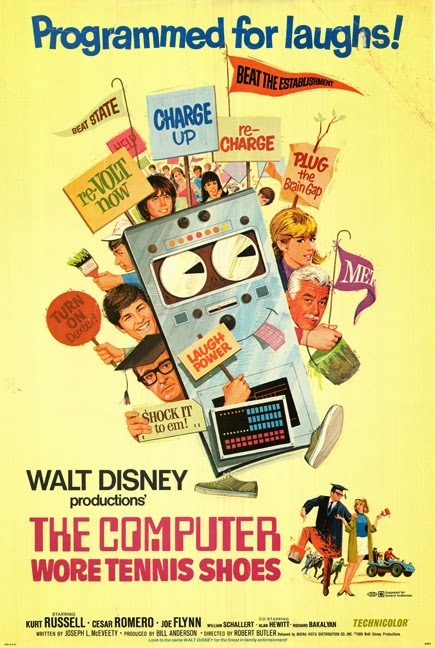 The Computer Wore Tennis Shoes was released on December 31st, 1969, making it the last film of the decade by a single day. It was critically bashed for being predictable and inaccessible to adults. But it was a huge box office success, leading Disney to produce two sequels (the first Disney trilogy). It premiered on The Wonderful World of Disney in 1972 prior to the sequel's theatrical release (Now You See Him, Now You Don't) and it was released on home video in 1985. I grew up in a world where owning a personal computer was normal, but my parents and educators always told stories of how they grew up knowing of a computer as a giant machine that filled a whole room. The Computer Wore Tennis Shoes must have a lot of sentimental value for people who grew up during the 60's and 70's. I was first exposed to the story in 1995 with the Kirk Cameron remake on Disney Channel and didn't see the original until I was in high school. The film is your typical fun Disney comedy, with less laughable moments than classics like The Absent-Minded Professor, but enough charm to hold its own. It is clear that much of the films' success can be attributed to Kurt Russell, who is so charming and likable as Dexter Riley that makes that character so memorable. Fans of Summer Magic may recognize the old yellow house with a bright 70's paint job during the rescue scenes towards the end of the film. There are a few references to this film at Walt Disney World in the Journey into Imagination attraction. There's a door in the queue with Dean Higgins' name on it and in the ride, there's a computer room with a sign that says "No Tennis Shoes." There's also a Medfield jacket on a char in the room. The Computer Wore Tennis Shoes is currently available on Blu-Ray as a Disney Movie Club Exclusive. This disc features a recent restoration that is well done, exhibiting great detail and accurate colors. The alternative is the DVD release, which features the VHS master in fullscreen with excess grain and scratches in the print. The high definition restoration is also available digitally from all major providers. Walt Disney had a lot of success with Westerns on TV, but his theatrical efforts had previously disappointed. Films like Westward Ho, the Wagons and Ten Who Dared were critical and box office failures. But with the studio still making films the way Walt would have, under the leadership of his brother Roy O. Disney, it was inevitable that the genre would be revisited. The source material was a book called Breaking Smith's Quarter Horse by Paul St. Pierre. Michael O'Herlihy directs his third and final Disney film. Louis Pelletier adapted the screenplay, his final theatrical film for Disney. Iconic film star Glenn Ford was signed on for his only Disney film to play the lead role. Nancy Olson returns to the studio, after memorable roles in Pollyanna and The Absent-Minded Professor. Her costar from Professor, Keenan Wynn (son of Ed Wynn) also returns for this film. Two songs in the film are written and performed by Bobby Russell. The film begins with a song about Smith set to Native American drawings on a wooden board depicting the story. Smith arrives at his farm after a disappointing hunt for meat. His wife tells him that she suspects the murderer Jimmy Boy is living with their Native American friend Antoine in his shack nearby. His wife is upset that Smith gives so much of their stuff to their neighbors, but Smith says if he doesn't nobody else will. Antoine is hiding Jimmy Boy and asks Smith to sneak him to Canada, but Smith convinces him to stay and wait for a trial. When a reward of $500 is offered for Jimmy Boy's capture, Antoine turns him in and collects the cash, since Jimmy Boy was going to willingly go to trial anyway. He buys a car with the money, but the breaks are shot and he quickly gets in a wreck. He is thrown in jail after accidentally pleading guilty to being drunk, meaning he won't be able to testify for Jimmy Boy. Smith has to borrow money from his wife to pay the $10 bail. A translator is present at Jimmy Boy's trial, but Antoine is uncomfortable and Smith ends up substituting midway through the prosecution. Following the trial, Smith is placed in jail for thirty days for getting into a fight with the sheriff. When Antoine reveals to the judge that he can speak English, he is able to convince the judge to let Smith go free. The film ends with Smith's friends arriving to help him cut his hay crop, a gesture of true kindness and friendship. Smith! was released on March 21st, 1969. 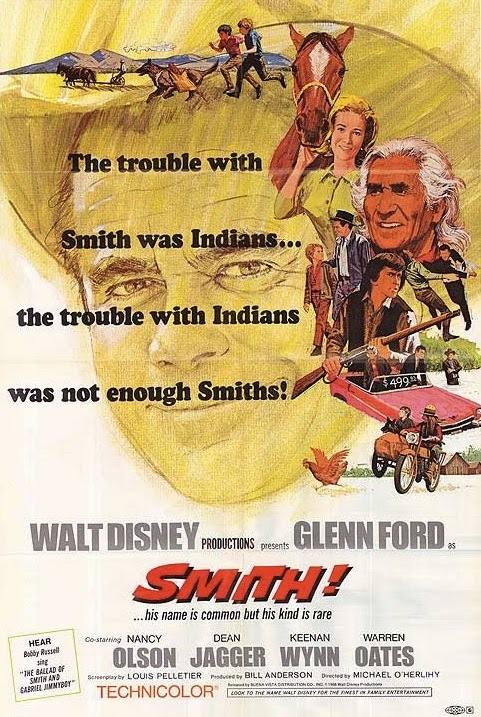 Released during a time when Native American rights were a hot button issue and shortly after congress passed the Indian Civil Rights Act, Disney was quiet with their marketing efforts. Critics ignored the film and so did audiences, making it a box office failure. Surprisingly, Disney chose not to air it on their weekly series and it wasn't made available again until 1987 when it made its home video debut. This film breaks Disney traditions in many ways. It's a story about racism and one man passionate enough to speak out in favor of freedom for all. It's about corruption in a small town where those in power refuse to recognize new laws. It's a much better film than the title would suggest and holds up as a unique entry in the catalogue of Disney films. 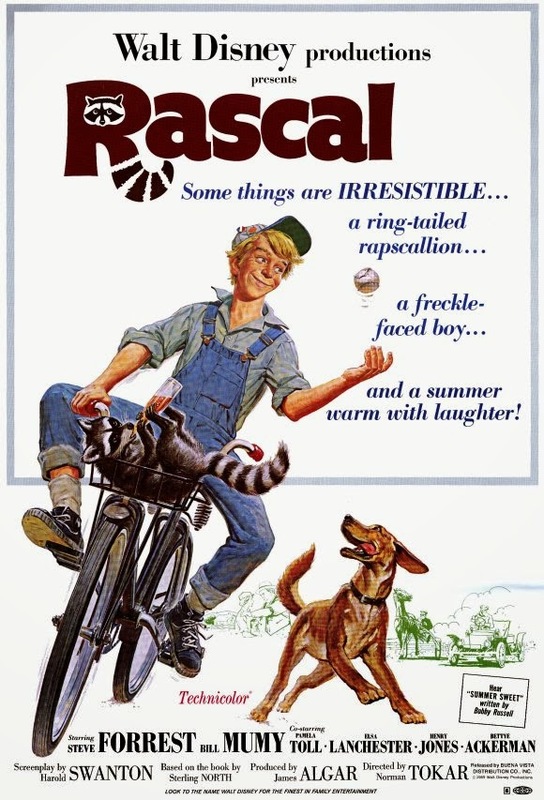 Producer Bill Anderson was striving to attract a more adult audience with this film, recognizing the importance of appealing to more than just kids or families. This was years before the studio would add a division for that very purpose with the creation of Touchstone in 1984. The original working title was A Man Called Smith. Smith! is currently available on DVD as a Disney Movie Club exclusive. A nice restoration was done and the film is presented in widescreen, but there aren't any bonus features. It is also available digitally exclusively on amazon, where it can be purchased in HD on select devices (amazon does not allow HD on iOS devices).